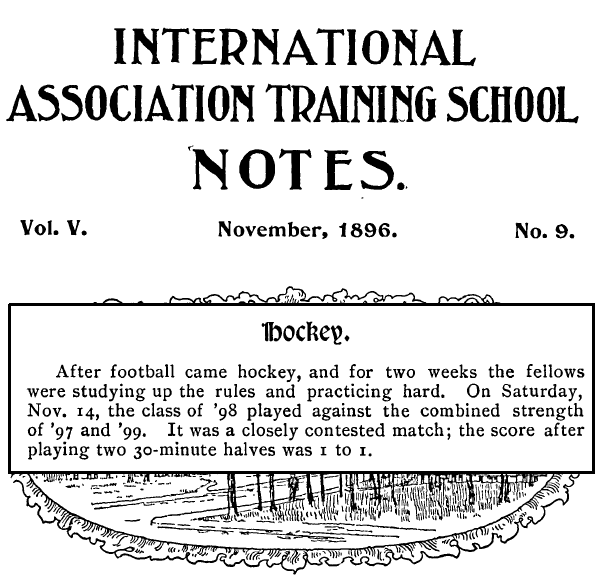 In an effort to add more detail to what I already know about early field hockey at the YMCA Training School (now known as Springfield College), I’ve been scouring that institution’s collection of digitized publications from the 1890s and 1900s. In doing so I think I may have pinned down the first organized and sanctioned college field hockey game ever played in the United States. I haven’t found any information that would suggest that field hockey was officially played at any other college in the United States before this game took place. The Woman’s College of Baltimore (now known as Goucher College) didn’t start playing until the fall of 1897, while 1896 seems to be the first year the sport was played at Springfield. So, unless I learn something new, I’ll assume that this game was the first of its kind. Of course, it was only an intramural match — I still haven’t figured out when the first intercollegiate game took place. Posted on December 20, 2014 December 2, 2015 by Eric MeanyTagged Goucher, Springfield.